It was a Friday night. And not just literally. Three years to the day after musician and artist Gavin Friday narrated the Prokofiev classic “Peter and the Wolf” at Dublin Castle, with the orchestra from the Royal Irish Academy of Music, to benefit the Irish Hospice Foundation (IHF), sixteen original paintings that were done for a companion book to Friday’s new musical version were auctioned to benefit the charity. On this spring-like November evening (Nov. 21), bidders and friends filled an intimate room at Christie’s New York in Rockefeller Center. They came to support the IHF as well as the hard work of the project’s engine. 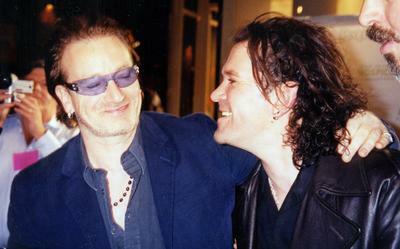 Ruth Barohn reports for U2log.com with Christopher Conroy.